Darius Pliskauskas scores against Telford in the play-off semi-final. 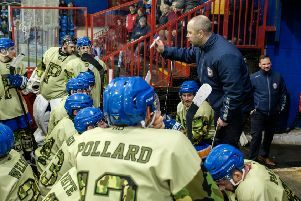 Phantoms player-coach Slava Koulikov has spoken of his delight at tying down several top talents for the long-term. Captain James Ferrara, sought-after defensive duo Tom Norton and Scott Robson, and import forwards Milan Baranyk and Darius Pliskauskas have all committed their futures to the city club for the next two seasons. Those deals have provided a major boost as Phantoms bid to build on their memorable success in the English Premier League play-offs at the end of last season. Koulikov, who has agreed a new three-year deal, said: “I’m very pleased to be able to keep such a good core of players together. “They are deals which give us both quality and stability for the next two years. It is essential to keep hold of good players when you find them and that is exactly what we are doing. “James is our leader and a great captain while Tom is one of the best British D-men in the league as far as I am concerned. Scott also had a fantastic first season with the club and has the potential to be a really good player. “Milan is such a professional guy on and off the ice. He lives the right lifestyle for a sportsman and ticks every box you look for in a player. Phantoms have now completed deals with 11 players in all. They’ve drafted in new recruits Lloyd Gibson and Craig Scott as well as retaining Janis Auzins, Edgars Bebris, Will Weldon and Martins Susters. They are announcing new signings at regular intervals with several more members of the play-off winning side expected to return. They include defencemen Cam McGiffin and Greg Pick, and forward Marc Levers. They still have one more import spot to fill and Koulikov confirmed he has held talks with Donatas Kumeliauskas about a return. The lightning Lithuanian international arrived last January and starred in the final months of the regular season before delivering a pair of terrific performances in the play-offs weekend.